The "Hikite for Power" argument is one of myths that has been around for a long time. Hikite (pulling hand) is for pulling on a part of your enemy. It is not for power generation. Try this simple experiment at home. There is more physics to the story here. This was an impromptu video I shot in response to some comments on a Face Book page. I totaly agree that the pulling hand is primarily for limb clearing. This is just a couple ways to use Hikite that seem to aid in power generation to me. The problem is that people don’t understand what hiki-te is supposed to be used for. The close-range nature of kata is not appreciated, so they expand everything to points sparring range. The hiki-te can’t be grabbing because there is nothing to grab (too far away), so they make up the idea of power generation i.e. “the EMPTY hand pulling to the hip rotates the body and that give you power”. The problem is the assertion is demonstrably false from the point of view of physics, bio-mechanics and combative function. The Chief Instructor of the dojo I started my karate journey at is one of the people who is actively trying to perpetuate the "hikite generates power" idea on Facebook, which has been part of an ongoing argument across a number of groups. He actually posted a video which, I suspect, he would use to illustrate a counter-argument to Andy's, in which he had a student stand in front of him, placed his fists on the student's chest, then quickly pulled one back to chamber, resulting in the student being pushed backwards, thus illustrating how hikite generates power, in his opinion. That resulted in further discussions about biomechanical structures, scapular movement, muscular contraction, etc. I would tend to agree with Iain that this type of thing stems from looking at karate from the long range, Kendo-inspired fighting made popular by karate tournaments, rather than looking at karate from the close-range, self-defense and law enforcement focused methods of kata. I think you make excellent arguments debunking the myth. Thanks for the comments, gentlemen. As we all know, there is more to the picture than what I tried to illustrate in the video. Trying to explain the physics of biomechanics to the layperson (especially to those indotrincated by large institutions invested in staying relevant) is no easy task. This debate will continue to the end of time. Sadly, you may be right. However, in the “information age” they may weed themselves out of the “martial gene pool” because they can only attract the small number who are also wilfully ignorant. For that it’s worth, here is my contribution. To this point, I can say that I WAS taught that idea in Judo, and it tended to hold true. We practiced our entries and throws such that they were large, almost over-exaggerated movements, and when we were doing randori or shiai, we would inevitably cut them short under pressure. I see that become a problem when students are only practicing the movements just enough to make them work in training, and then when they try in competition they fail at it over and over again. That is a specific methodology and context, though. Even so, I can see the final resting place of your hikite as potentially being over-exaggerated, depending on how far you end up being able to pull your opponent under pressure/resistance, but I wouldn't say that it is purposely over-exaggerated. I think a lot of it stems from back in the day where Japanese instructors were sent out to many places with a relatively poor grasp of English and when asked for the reason they said power generation etc. And many English instructrs went "Oh sensei said X, so it must only be X and we cannot change his word. We only train hikite for power generation." It is also something I see where people train at the dojo then that is it, there is no real additional training or learning of karate. So often the people have to be constatnly taught the basic macro movements, instead of refining their micro movements to become their macro movements. So in my opinion, this often comes across in how things are taught. "Oh hikite is for X" because it is a simple explanation rather than the more "complicated" stability / trapping / holding movement. Karate has fallen prey to its own "logic" in that karate is supposedly long distance (nowadays more people are seeing it as medium to shrot range but that is another discussion). I can see the final resting place of your hikite as potentially being over-exaggerated, depending on how far you end up being able to pull your opponent under pressure/resistance, but I wouldn't say that it is purposely over-exaggerated. Brilliant! Totally agree. In combat, the enemy’s resistance, inertia and the motion relative to us will determine where the hiki-te ends up. In the kata, we practise a full and complete movement because there is no body there for the force to act upon. Yes, I see exactly what you mean. I could see how that kind of practice (over-exaggerating a movement) could be useful for certain techniques. I have to confess that I've never really thought about it much until now. Of course, I do strive to practice techniques in something close to their "ideal" form whenever I can (getting complete follow-through and all of that), but I don't purposefully exaggerate them. If it's showing benefits in randori, I agree that it's certainly something worth considering. As you say, depends on the context. I probably wouldn't do it for punches, but I could see it working well with joint breaks or big throws or maybe overhead hammerfist strikes (and so on). This is an even harder thing to counter in Taekwondo where the "it increases power" explanation for the hand on the hip is so ingrained it has made it in as a mock-scientific official theory on power generation using the "every action has equal and opposite reaction" idea from physics. So much so that the hand on the hip isn't called the pulling hand anymore but the "reaction hand". I'm genuinely baffled why a practical use for the "pulling hand" was obscured for so long when the actual name of it is a massive clue and points the way. It's right there in the name! If that hand doesn't have something in it then it can't be a pulling hand. It has to have something in it to qualify. When you see pictures of tegumi, the Okinawan sumo-type wrestling which was apparently very popular in the island historically, you see the grip is low and and pulling towards your own waist similar to the hikite motion and end point in karate. Was it perhaps more obvious to Okinawans that the hikite hand represented gripping something because of the widespread knowledge of tegumi? Especially if they were aware that the karate of the kata was about close range encounters. It is reinforced by the idea that gripping near your centre of gravity has mechanical advantages for shifting or unbalancing a heavy object using your whole body weight, which is central to karate motion. So ... the main purpose of hiki-te is pulling the opponent's limb/clothing/&c to disrupt and off-balance him ... the "close range defence" explantation. I think that the hiki-te hand has a utility in the kata and self defence realm beyond its primary "pulling" purpose, and this does have to do indirectly with power generation, at least for beginners. Beginners will often try to punch with their one arm, rather than with their whole body, or perhaps they are able to engage some of their body on the "punching side"; if they are able to engage their hiki-te hand though, they have far more tendancy to engage parts of both sides of their body, so a significant step forward in being able to punch with the proper full-body dynamics. Of course, there is no reason that can't be accomplished by telling the beginners ... and sometimes showing them and letting them experience ... that the reason is to pull the opponent off balance. In fact, I suspect that would be far easier for beginners to grasp and thus want to master, compared to Sensei stopping the training session to engage in a confusing lecture on physics. Of course, hikite is for pulling on the opponent. Some reasons why some teachers told/tell their students that it is for generating power have already been discussed. I would like to add another corpus delicti: Masatoshi Nakayama's book "Dynamic Karate" (translated by Herman Kauz). This is a very influencial book when it comes to defining and describing karate techniques. In the book Nakayama describes in great detail how to do a gyaku-zuki (straight reverse punch) and discusses a lot of important points. He does a pretty good job! The chapter is well worth reading. Although he tries to meticulously cover every aspect, his descriptions still leave room for misinterpretation which might have (in part) lead to the idea that the pulling hand is for power generation. a) He does not mention that the pulling hand is supposed to pull something. This is not surprising, since his book is not about kata application but about correct movement and a bit about sports kumite. It still is unfortunate. b) He does not absolutely clearly state that hip rotation should hinge on one side while the other side moves forward. There are several clues though. For example, he writes: "Rotate the hips, keeping them at the same level during the turn. Straighten the rear leg and shift the center of gravity slightly forward. Imagine that you are pushing the hip bones forward as you turn." But it still can be read as though one side of the hips turns forward (the side of the punch) and one side turns backwards (the side of the pulling hand). c) He includes two decriptions of the use of the pulling hand that suggest that its being pulled backwards improves the actual punch: "To increase the speed of a punch, make use of the reaction of the opposite arm. The faster you retract the opposite arm, the more speed and power will be evident in your punch." - "... imagine that the left hand and the right hip are connected by a rope attached to a pulley some distance ahead. As the left hand withdraws, the right hip should automatically move forward." This illustration is simply wrong and in disaccord with the verbal explanations in the text. I don't know whether it appears in the Japanese original version of the book or whether the translator has added it. Does anybody happen to have the original to check this? I want to make it clear that I singled out the few points that would allow for a misinterpretation. The text in its entirety is in fact really good regarding correct form of movement and common errors. Beginners will often try to punch with their one arm, rather than with their whole body, or perhaps they are able to engage some of their body on the "punching side"; if they are able to engage their hiki-te hand though, they have far more tendency to engage parts of both sides of their body, so a significant step forward in being able to punch with the proper full-body dynamics. I’m a great believer in gradually building up skills. I also think that anything that does not contribute to that skill development should be avoided (waste of time). This is especially true of anything that is counter to the skill being developed (i.e. develops a habit that is counter to the goal, makes one less effective, and needs to be undone later on). 1) Pivot from the side of the hip whenever possible. 2) Keep the hands active at close-range. If they are not active, they should be up. I’ve never experienced any need to move away from these concepts when teaching beginners. Central pivots and empty low hands are not something that should be taught. When my beginners are doing kihon, they learn to hit with both an active and inactive non-striking hand. Both can be done with correct body mechanics by beginners. I totally agree that beginner’s need to know why the hand is on the hip in kihon. Where I would disagree is that physics can justify an empty hand on the hip. Attempts to do so are always flawed and are done in a doomed attempt to justify the practise from a long-range “power generation” perspective because they fail to grasp the close-range combative use of hikite. Where I would agree is that such “confusing lectures” can sound plausible i.e. “I didn’t understand any of that, but it sounds really clever, so I’ll accept that physics justifies the practise.” The bottom line is that it does not though. The image below was sent to me by a professional physicist. He is clear that the argument for hitike as power generation is false. The formula in it are totally beyond me, but I know from the countless number of punches I’ve thrown over the last 36 years that a pivot from the side of the hip generates much more impact. I also know that an empty hand on the hip is a huge combative error and that hands need to be active at close-range. There are many good arguments for active non-striking hand. I’ve not heard any good arguments for an inactive hand pulled to the hip. People try physics, body-mechanics, pseudo-history, etc, etc and none of it works. It baffles me why “the pulling hand pulls” is a concept that has such strong resistance in certain quarters. In the book Nakayama describes in great detail how to do a gyaku-zuki (straight reverse punch) and discusses a lot of important points. He does a pretty good job! He does! The photos are also clear that he’s enacting very sound power generation principles. The transfer of mass and rotation are enacted and explained superbly … with the exception of hikite. As you’ve mentioned, the photos and other text suggest he is not actually rotating around the centre. …. 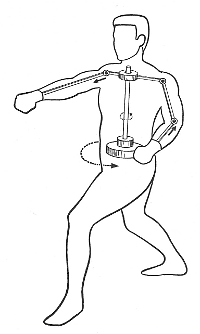 Drawing of a person performing a gyaku-zuki (reverse punch) with an illustration of mechanical mechanism that shows a center axis rotation with the punching arm moving forward and the other arm moving backwards. …. This illustration is simply wrong and in disaccord with the verbal explanations in the text. I don't know whether it appears in the Japanese original version of the book or whether the translator has added it. Does anybody happen to have the original to check this? The illustration is indeed wrong. My strong suspicion is that it’s an attempt to justify an empty hand on the hip when punching at long-range. A look at the bunkai in Nakayama’s work make it clear that the thinking is clearly long-range fighting, with fellow karateka, who wait in turn to attack along the cardinal points (all practises that were derided by the karateka of earlier generations). When kata is shifted from close-range to long-range, you have the problem of what the hands on the hips are doing. At close-range, it is obvious. At long-range, there is no need for it and it’s clearly a tactical mistake. “Power generation” seems to be the favoured way to square the circle. At first glance, it looks right. It’s not, but it can look that way; especially when we use mechanical illustrations and scientific sounding language. The text in its entirety is in fact really good regarding correct form of movement and common errors. I fully agree. My take on this is that Nakayama clearly gets what a powerful punch requires. You can both see and read that this is a man who understands how to hit very hard. However, that karate presented is very clearly of the 3K variety; hence the issue of empty hands on the hips arises. To address that issue, Nakayama moves away from sound physics and biomechanics. Not in his movement, or in his explanation of things in other areas, it’s just this one point. It’s a hole in an otherwise sound set of explanations, and I think the reason that hole exists is simply to “explain” why we have an empty hand on the hip. It’s been 1 month since I posted that hiki-te video on YouTube. Since then it has been watched for a total of 1185 hours. The current feedback stands at 94% Likes (802) / 6% dislikes (45). It is obviously very disappointing that concepts that are clearly wrong tactically, wrong historically, and that go against the laws of physics still persist within karate circles. However, the positive message is that the video has been watched for around 40 hours a day for the last month. So, interest in these topics is obviously high. The other good news is the like to dislike ratio shows that people overwhelmingly find the content resonates with them. The dogmatic minority were quite vocal during the debates that the video sparked, but the statistics paint a very clear picture. There are lots of karateka re-examining the art and sharing their ideas. There is a very receptive audience for those ideas too. Lots of good people doing good things. It’s great to see the art becoming strong and respected once again. There will always be a minority who will dogmatically stick, for good and for ill, to the karate they experienced in a given time period. However, with each passing year that minority becomes smaller and less influential. Pragmatic karateka like us are no longer swimming against the tide, but with it. As Funakoshi said, “Times change, the world changes, and obviously the martial arts must change too. The karate that high school students practise today is not the same karate that was practised even as recently as ten years ago, and it is a long way indeed from the karate I learned when I was a child in Okinawa”. The karate of today is changing rapidly. It’s simultaneously moving back to its pragmatic past and drawing heavily on its traditional roots, while also moving forward to adopt new and more efficient training methods. Karate can only express itself though the karateka that practise it. The current generation contains many who are thoughtful, open-minded, pragmatic and enthusiastic. This in turn manifests a karate that has a deep and true tradition, is open to new ideas, appreciates the value of self-examination, is functional, and is a joy to practise! That’s the karate that will attract the most practitioners. That’s the karate of the future. What is kind of hilarious about the people who disparage your position on hikite is that they come mostly from the modern styles of Karate that evolved alongside the sportification of Karate. I say that this is hilarious because I was watching some old footage of Joe Lewis's sport Karate matches from the 60's yesterday and he used hikite EXACTLY the way you do. He would grab his opponents wrist and use it for control as he landed kicks and punches. If he knew this in the 60's the power generation set have no excuse.